Automatic crucible-cover placement and removal provides for better volatile matter determination by reducing sample oxidation and eliminating the possibility of contamination. Operator safety: Risk of operator burns is reduced since the furnace does not have to be opened manually to place/remove covers. Elimination of the possibility of the covers falling inside furnace. No waste of consumables and reduced consumption of resources. Although specifically designed for the coal/coke industry, the TGA-2000A may be used in any application where crucible covers need to be placed/removed. Quickly determine moisture, volatiles, ash, fixed-carbon and LOI (Loss on ignition). Coal, coke, etc., and any application where automatic placement and removal of crucible covers inside the furnace may be beneficial. Temperature regulation is plus/minus one degree centigrade. Complete brand name digital precision balance of 0.1 mg sensitivity with display. Parts are standard and generally available locally. 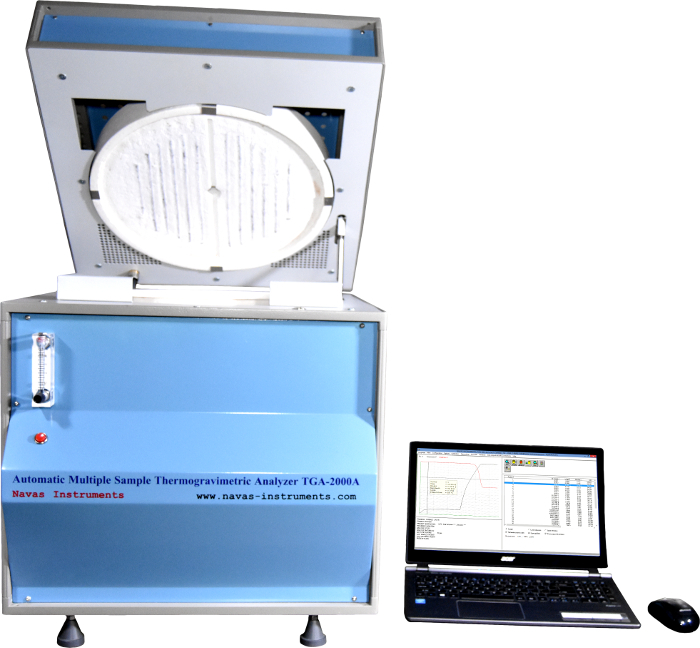 All Navas Instruments thermal gravimetric analyzers fully comply with standard methodologies related to this type TGA analysis.